Oil on canvas, 36 x 49 cm. 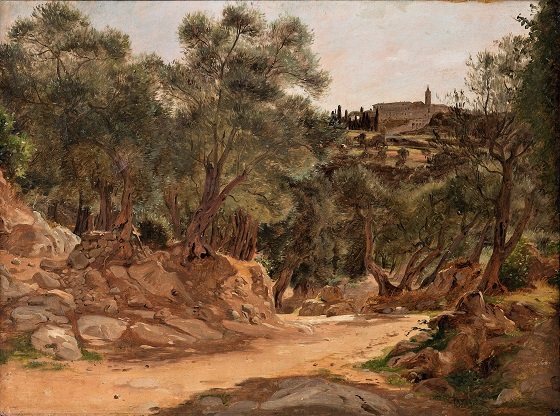 Like many Danish Golden Age painters who stayed in Italy in the years between 1835-1845, Jørgen Roed visited the countryside around Tivoli and Olevano east of Rome on multiple occasions. This landscape study is probably from an area in the mountains immediately outside Tivoli. The depiction of the dry landscape with the silver-green olive trees in the harsh afternoon sunlight is objectively observed, and is marked by the still unfinished character of the sketch. Perhaps this is due to the fact that the painting was, in fact, painted out in front of the subject, on the small dusty path that leads through the olive grove.